"At the moment, we have not set any deadline to regulate even though around 13,000 alternative medical practitioners have registered with us. The main challenge is getting the training syllabus ready and only then we can start implementing and initiate the conversion programme for all," he said, after giving away certificates to 60 traditional Chinese medicine practitioners at Rehabilitation Hospital Cheras (HRC) here today. It is estimated that there are nearly 30,000 alternative medical practitioners and so far only Chinese practitioners have given encouraging response with 8,000 people already registered voluntarily in comparison to Indian, Malay, Islamic medicine, homeopathy and therapy practitioners. "We are taking this process step by step before we can regulate. We have to be fair as we must also provide them with enhancement course and expose them with technical aspect as well. This process will take a minimum of 6-month to complete after registration," said Dr Jeyadurai, adding that more than 17 hospitals are equipped with TCM facilities and practitioners. He said the Act is necessary to curb harmful complementary medicine and fraud by unauthorised alternative medical practitioners. 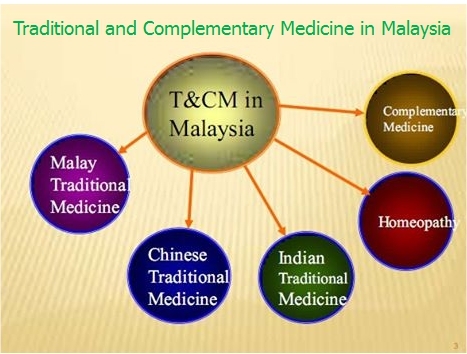 He added that the three traditional medicines practised such as Ayurveda, Malay traditional massage and Chinese medicine are currently being accredited by the ministry's TCM unit. At the event, External Basti Therapy programme — one of the Indian's Panchakarma alternative medicine practice under the Ayurvedic healing system — was launched with Indian High Commissioner Shri T. S. Tirumurti, HRC director Dr Roslan Johari Datuk Mohd Ghazali and Health Ministry Complementary and Traditional Medicine Unit director Dr Goh Cheng Soon. Dr Jeyadurai said the Indian medicine training syllabus will be discussed during the bilateral meeting between Prime Minister of India Narendra Modi and Prime Minister Datuk Seri Mohd Najib Abdul Razak this week. "We are seeking assistance from the Indian government on how to train and regulate the Indian medical practitioners. We hope we can finalise it soon," he said.